I haven’t the slightest idea how this roll got it’s name. I did a search for “Queen of the Tom Tom”, and the only results I got were my pictures of the roll on flickr, and the restaurant menu where the roll originated. To me, it sounds like the name of either a ship or a rock n’ roll band, but neither of those came up in my search so for all I know, it’s a made-up name! Not that I’m complaining. The roll is delicious! Bake or fry tempura shrimp, according to instructions on the package. 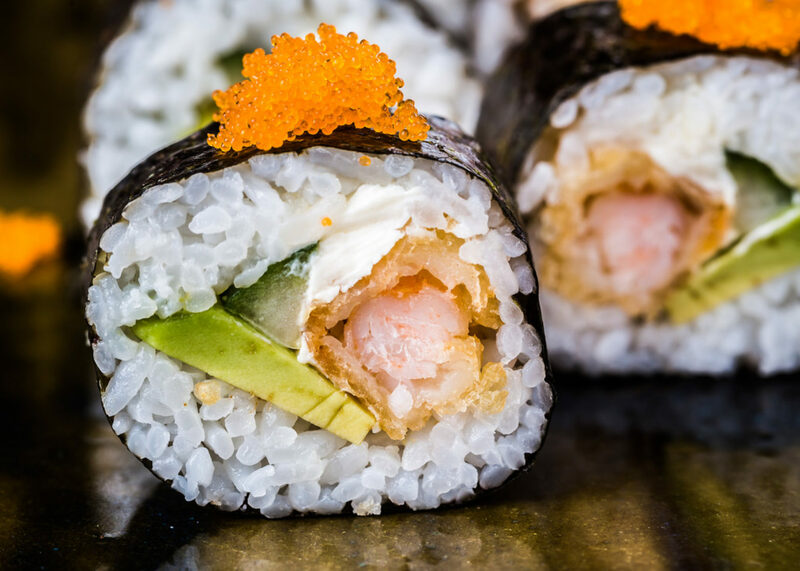 Roll the sushi, using a couple of tempura shrimp, cream cheese, avocado, cucumber, and the spicy mayo as your fillings. Sprinkle some tobiko on top of each slice. I really like the name on this one Allison! It totally looks delicious like you said! You had me at tempura shrimp! My favorite all time roll is a shrimp tempura rainbow roll that I get a San Francisco sushi joint. I know I would like this roll. Rachel – Yep, they are delicious! Chuck – 😀 I’ll bet you would love it! I really love your website. 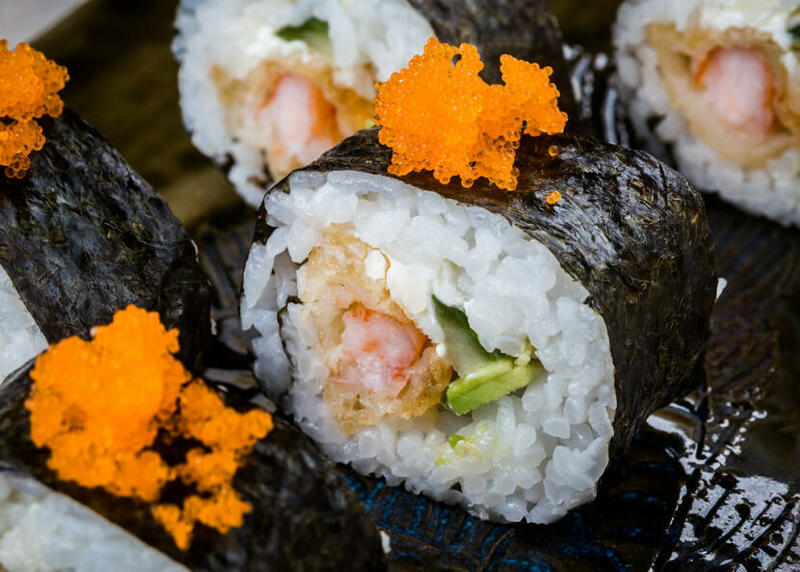 I was surfing around for information on “how to make” sushi…and yours is the best I found. Your recipes and reviews are awsome! Do you order your tobiko online or can I find it at a store. I live in the Dallas/Fort Worth area of Texas…And we have an excellent Sushi restaurant here too…Japanese Palace. Thanks! I find tobiko at my local Japanese store. I know it can be ordered online, but I’ve never needed to, so I can’t vouch for the quality of it. Sounds delicious. Odd name for a sushi. That is true just by looking at the picture my mouth started watering I think it is yummmm…. and this is cool name for sushi.